Nice to see you back. Hope you had a good time with your visiting family. Enjoy your cuddle time with Medha. How we miss our loved ones when we are apart. Beans sound delicious. Stay warm and dry! Fantastic recipe. I'll be trying it. Oh Manisha, thank you so much for writing this post and for the recipe and the photos. Give Medha a hug for me and tell her that I too am counting the days until her Daddy comes home and your family is complete again. It’s funny isn’t it how children look to each of their parents for some of the same signs of love and protection and yet each parent provides a complimentary part of the sense of security and both are needed for a total feeling of safety. I smiled at the talk of your monkeys and felt your love for your family in every word you wrote. I am so happy to have the recipe; when we cooked together, the green beans, which were one of my favorite dishes, seemed pretty clear cut and I thought I would remember what we did. But in fact the five of us had so much underway at once, on the stove, in the slow cooker, on the induction burner that it all became combined in my memory. I will have to find out where you buy the peanuts and the Kanda Lassun Masala. LOL, I’m sure if you had not discussed the peanuts in detail here, I would have used something like Planters! Our street looks much like your street, the long hills of snow on either side of our driveway continue to grow also. Max shoveled twice today and I cannot believe that more snow is forecast for next Friday-the fifth Friday in a row. Finally a post from you!!! Peanuts and green beans - that's a winning combo with 'N'. Good recipe and wonderful step by step presentatin. So how is the weather there? Settled down? wow! your photographs are so cool, they make my mouth water. will be back for more. Is the masala similar to 'ghati masala'? Lots of garlic and red chilies, and seems maybe some dhaniya it has. I use it to make stuffed eggplant. 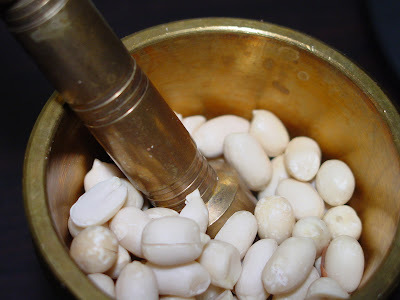 I think I'll try making beans this way and use the ghati masala anyway. 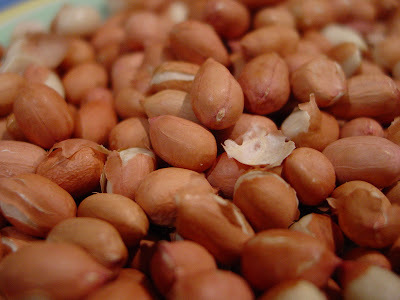 I was really impressed with the everyday peanut use in traditional Maharashtrian cuisine. In salads was a total revelation - seemed so 'gourmet' when I saw my MIL make the winter koshimbir with a lot of fine chopped vegges and then toss in some crushed peanuts. Delicious. BTW: I agree. God is non-veg - not many seem to 'offer' him non-veg prasad! Baring Kashmiri Pandits and Bengali Brahmins, I think! Both worship the Goddess actually. So maybe, not the God, but the Godesses are non-veg! Bless us. Did I tell you that you have the most adorable little girl? Anjali, thanks! We had a wonderful time with my sister and her family. Pradnya, welcome! He's definitely not getting me any curtains, what with the current debate of 50lbs or 70lbs per bag. And it might just be for the best. Just before we got married, he surprised me by getting curtains made for our apartment. I loved his choice of material and design but the windows looked like they were wearing mini-skirts! Kitchen hand, welcome to IFR! Do let me know if you liked it and if you had any interesting twist of your own on this recipe! Lee, took me long enough to write this one up, eh?! You are so right - we each play our role and we're complete when we're together. When I think back to when we cooked together, I still wonder how we managed to get so much done! You should be able to get raw peanuts at the Indian grocer's on 28th and Valmont in Boulder. I am not so sure about Kanda Lassun Masala but I do know it's available at Krishna Grocery, off 287 in Lafayette. I'll be making my weekly pilgrimage to Krishna some time so I can pick up a packet for you. I guess Boulder picked up more snow than we did this weekend. We barely got 2 inches or so. It feels so insignificant compared to what folks in the mid-west and up to NY are going through with all this ice. Snow on Friday is becoming the rule rather than the exception - I hope it is just mountain snow! Mythili, keep using those winning combos! ;-) We are thawing out slowly and will reach freezing by Wednesday! Yay! Maybe some of the snow will actually melt! Jacob, welcome and back at ya! Your sketches and paintings are awesome! When you get a chance, take a peek at Flower Fest. I sthought I might get flak for suggesting that God is non-vegetarian! Who knows, Balasaheb might send someone to my doorstep demanding an apology! I still remember the time they went up in arms over Parvati Khan (remember her? she used to sing? Oh! now I am dating myself, aren't I?!!) and how she should not be allowed to have a name like that! Preya, welcome to IFR! Another Colorado blogger! Yay! What a lovely post Manisha!!!! Enjoyed reading it through and through!!!! And the nutty beans sounds super!!!! I never saw this blog of yours ! Great recipe - for a foodie like me even the write up makes me feel hungry and the cool pics makes me feel all the more tempted. But even more than the recipe what I liked is the way you described the incident about your daughter...give her a hug from me and tell her that an uncle from India has sent loads of love for her..
btw, do you like sweet dish ? 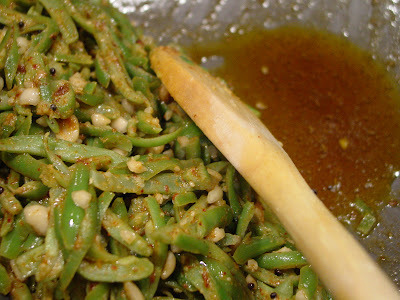 I can send you some good bengali sweet dish recipes if you want to share with your readers .let me know. Hi manisha, just stumbled acrass your blog. I love it! 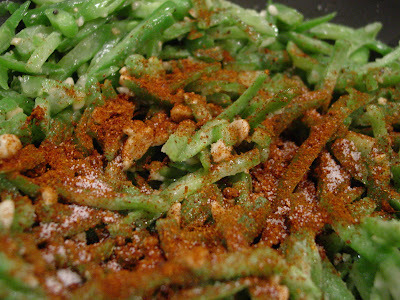 This green bean recipe sounds fabulous... can't wait to try it. Do you mind if I add you to my blogroll at www. amiraskitchen.wordpress.com? Coffee, thanks! Now go pick up that paintbrush, put it to canvas and send in an entry for Flower Fest - J! Saptarshi, welcome! I'm glad you found my blog. I would love to try out your Bengali recipes! I'll get in touch soon! Amira, welcome to IFR! Go ahead and spread the link love ;-), I will be truly honored! I should give this version of delicious beans a shot. I've always made them the South Indian way, by adding vangibath powder. I'll look for the kanda-lasun masala on my next trip to the store. BTW, I live in Northern CO too. The weather has been nothing less than excruciating! Stay warm & safe! I immediately thought of curtains when I saw Medha's question and now I see I'm not the only one. : ) And with not even a twinge of conscience, SRK gets all the blame - hahaha!! Take care. Good to hear you guys are doing good... beans look delicous. Have never used sea salt. Green beans look nice and yummy, love your writing, it made me smile :). glad to hear that all is well and you are keeping good spirits despite the dropping temperatures. It is hard when the significant other travels. My husband travels a lot too and we too go through the routine of checking every lock and window before bedtime. That kanda lasoon masala sounds soo good. I will have to look for it at the indian stores the next time I go. Grean beans and peanuts?? what's not to like? sounds like a winning combination! Aww, what a wonderful write-up Manisha, ditto at scorning at SRK!! My Hubby left to India yesterday as well, and with the layers of snow we're currently having here, I made sure we shopped for enough groceries to last me the 2 weeks he'll be away! 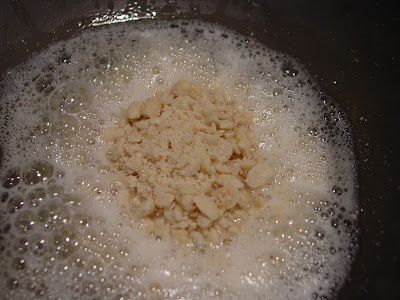 nice step by step instuctions of the nutty beans recipe.Iam competely new to this.Thanks for sharing this. Thanks for this recipe :). Your Medha is a sweet darling. Looks like all the kids are SRK fans. Even I was his fan when i was kid, now I don't understand what I saw in him :D.
Medha's question is going into my "SRK kid's dialogue" collection. I know few more kids who are crazy about him. About snow, I remember last time I left a comment here saying I love snow. Soon after that we got an ice storm here. After slipping and falling on the ice a couple of times, I am praying god not to give us any ice/snow storms. My leg still has a blue patch of blood which keeps on reminding about the fall :). have never had green beans with peanuts before (although I make 'em with sliced almonds once in a while). Gotta try your version. A divided bunch, I see! Dissing SRK is a lot of fun! HareKrishnaji, welcome! Aha! Tumchya ghari pan maakad aheth asa distay! Boiled peanuts, shell on, are to die for! When I was much younger and did not know of the perils of too much sodium, I used to drink the salty water when I thought no-one was looking! Roopa, yay! Another Coloradoan! Great to have you here at IFR and thank you for all the compliments! Did you enjoy the 6th weekend in a row of snow?! Beans with vangi-bhath powder? Now that's something I haven't tried. Do you add anything else? Do let me know! NSG, ha! ha! But no such luck! No curtains in my naseeb! Welcome to IFR! Krithika, I'm thrilled you liked the beans! About sea salt: I've tried different types of salts and I liked sea salt the best. According to me, it brings a different flavor to the dish and reminds me a lot of coastal foods. Apparently I am being a little snobbish by saying that but it takes the dish to a new level. My sister, who visited me recently, recommended it very strongly and I quite agree! I must add that my husband shakes regular table salt over everything that has sea salt. He prefers a taste that is more salty than subtle. Monisha, welcome and thank you! When do we get to see another yummy cake from you? ifood, thank you and best wishes on the success of your web site! SH, we should get together and set up some sort of a support group for one another, I tell ya! 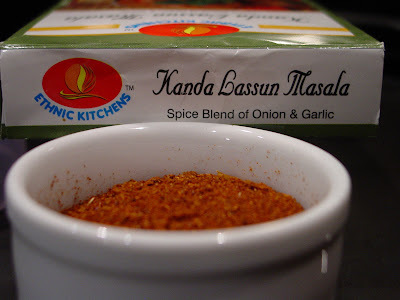 The kanda lassun masala has a lot of possibilities. Think vada-pav. Yum! Meena, it's no fun to be cold and alone in weather like this! I hope you cooked a lot of comfort food and stayed warm. Good to have you here! Meena K, that's the beauty of being a child. They have no inhibitions or life experiences that present barriers - they let their thoughts run and they flow with it. Oh to be a child again! Trust you to read the fine print and put together the masala! You are too much! 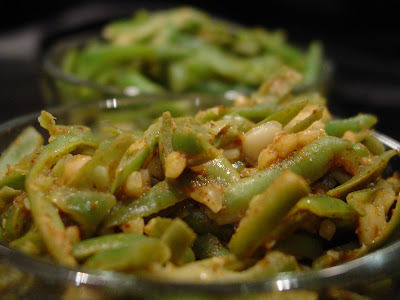 I am glad you and your family enjoyed my nutty green beans recipe! Shilpa, glad you grew up and got some sense in your head! SRK! Tch! You take care out there! I hope it's not as icy and slick anymore and you're settling into your new routine well. Best wishes to you! Inji, hope you're getting your strength back! Snow! Sigh. It's become a way of life now. Shammi, third bandar? Third?! Now I wonder what you're going on about! :-D Hey, sliced almonds sounds really good. I have a large bag of sliced almonds that I sprinkle liberally on salads. Do you have a recipe for beans with sliced almonds? tpraja, I'd be very interested to know who's paying you to spam all our blogs. This is your nth spammy comment about byIndia on my blog. I don't appreciate it. Web2 Corp's Trevor Longino said that byIndia is a "small company with big dreams and cannot afford to dedicate someone to manually filter" the blogs to ensure that there are no scraped blogs on byIndia. You're no bot. You are a person who has been dedicated to manually add comments on blogs. I am sure Web2Corp will cry foul yet again. Any more comments from you - food related or not - will be deleted. Ugh! Heard about all the freak weather you have been having in the US - too much snow in CO and too warm in NY! Is that the reason for your longish hibernation! :) Come out, Manisha. - tell us what you have been cooking. It is already Spring time here in N Delhi! Just going thru your old stuff: didn't see the 'comments' on "handy tips" - I too freeze left-over tomato paste!! Waste not, want not. Anita, just been very busy! Snow. Ice. We've got it all. 7th week of snow. They actually count # of days of snow on the ground here in Colorado. They are just not used to having snow on the ground because it snows and the sun comes out and melts it away. This winter, there hasn't been much melt-time between storms. Sigh! At least the hubby's back. Didn't shovel this past week! Thanks for letting me know about comments not being on for the tomato paste post. Will go flip the switch on that one now.